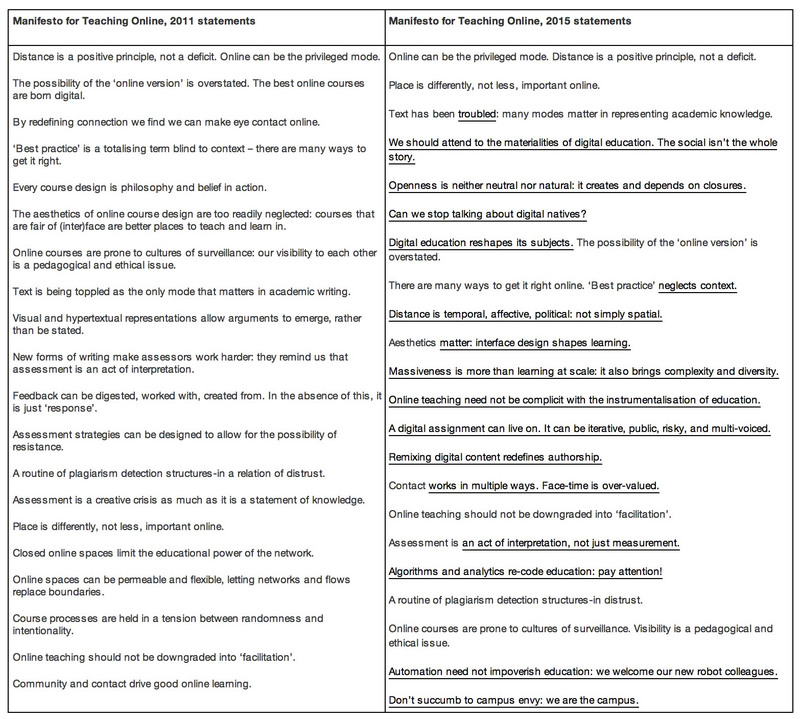 This is one of a series of blog posts that will appear here in the coming weeks, reflecting on aspects of the 2016 manifesto for teaching online. The manifesto’s treatment of openness is one of the biggest shifts between the first and second versions – and it’s been noticed and commented on by a number of people already, including Jenny Mackness in her recent post. In 2011, MOOCs hadn’t yet emerged on the scene, and a primary mode for online education – despite many years of engagement with the idea of open educational resources – was to be closed off from the wider web, corralling students and teachers into ostensibly ‘safe’ spaces designed for educational purposes (Bayne 2004). Discourses of digital education are far more likely now to draw on ideals of openness than of closure or constraint. However, these often lack criticality, assuming that openness is inevitably empowering, and will inevitably disrupt and improve education (Bayne, Knox and Ross 2015). Openness itself is not often critically interrogated as a term, being taken, problematically, to mean ‘access alone’ (Knox 2013). Richard Edwards (2015) argues that ‘all forms of openness entail forms of closed-ness’ (p.253) and that educators must move away from ‘pursuing openness per se as a worthwhile educational goal’ and instead decide ‘what forms of openness and closed-ness are justifiable’ (p.255). Martin Weller (2014) suggests that this issue may in fact only really be able to surface now that what he terms the ‘battle’ for openness in education has been won: ‘when it was simply open vs. closed there was a clear distinction: Openness was good, closed was bad. As the victory bells sound, though, it doesn’t take much examination to reveal that it has become a more complex picture’ (p.21). He attributes this in part to the adversarial framing of openness (p.153), which has generated a series of binary positions which are, at best, oversimplified and misleading. So, a tension between openness and closure is expressed in the manifesto as a reminder that openness is not neutral, and that educators need to be cautious about embracing promises of openness without exploring the closures that will come along with it. This is a practical as well as a theoretical consideration: we have to understand that there are tradeoffs when, for example, we ask students to work openly on the public web (as we have done since 2009 in our Education and Digital Cultures course), in terms of how frank students can be about how the concepts they are learning about intersect with their professional practice. This is part of the reason why our introductory MSc Digital Education course, while it involves students in extended blog activities over the whole semester, does so in a relatively ‘closed’ space of one-to-one student-tutor discussion. We need to approach openness in different ways at different times. I’ll be talking about some of these issues with Amy Collier at the OpenEd conference in Vancouver in November. I also strongly recommend the recent special issue of Learning, Media and Technology (edited by Sian, Jeremy and me). And really any of Jeremy’s work and writing! Bayne, S., 2004. Smoothness and Striation in Digital Learning Spaces. E-learning, 1(2). Bayne, S., Knox, J. and Ross, J. (2015) Open Education: the need for a critical approach. Learning, Media and Technology, 40(3), 247-250. Edwards, R., 2015. Knowledge infrastructures and the inscrutability of openness in education. Learning, Media and Technology, 40(3), pp.251–264. Knox, J. (2013). The Limitations of Access Alone: moving towards open processes in education. Open Praxis. 5(1). pp. 21-29. Weller, M., 2014. The Battle For Open: How openness won and why it doesn’t feel like victory, London: Ubiquity Press. Available at: http://www.ubiquitypress.com/site/books/detail/11/battle-for-open/ . The manifesto is four years old, and lots has happened in the digital education space since it was first published. We always said we wanted it to be a living document, so we are putting that principle into action and have spent the last few months revisiting the statements. This has been an interesting process of discussion and debate, both about what we still feel strongly about in the manifesto, and what we think it needs to take more or different account of in this time of of increasing attention to scale, materiality, code and automation in online education. The Digital Education team will be relaunching the manifesto soon! We’ll update the blog when we have a publication date finalised.